There are so many factors contributing to the successful sale of your home in Morristown, NJ. There’s the marketing aspect, the listing photos, the age of the home, what comparable homes are going for, the school district and the neighborhood. One factor within the home that is crucial, however, is the state of the kitchen. Potential buyers will hone in on this aspect of the home right away. It’s the central hub for home life. How clean is it? How inviting is it? Can we picture ourselves in this space? These are important questions buyers will immediately ask themselves. So make sure to spend some time and TLC on this aspect of your home. One sure way to run off potential buyers is to leave any trash lying around. Even if the trashcan is overflowing or stinks at all, they will be sure to notice. Clean and scrub garbage cans, stow them out of sight, put fresh bags in and clean all trash up off the floor and counters. Make this space not only presentable, but also spotless. It’s good to give yourself a half hour window at least before any showings just to spend in this room tidying up. Just because you love your fur babies does not mean that potential buyers will feel the same way. Especially if they walk into a cat lounging on the kitchen counter or the litter box on the floor in plain sight. That will send them running! So hide the litter box, dog toys, and even move food and water dishes out of sight or tidy them up. Sweep up the hair. And consider taking your pet outside for the duration of the open house or showing. Another aspect of the kitchen being a hub of home life is it turns into a dumping ground and holding space for clutter. Nothing wrong with this, but before a showing, take a few minutes to do a sweep of the kitchen. Stow piles of mail in a drawer, put kids toys back in their home, do any dishes left in the sink from last night’s dinner and remove any extra supplies left on the counter tops. Removing the clutter will allow the kitchen to shine and show potential buyers what’s really there to work with. This one is huge! Don’t neglect your pest control services even as you are trying to sell the house. Keep those visits scheduled for maintenance. But also stay on top of any problems you may see with pests. If there are droppings, don’t wait but call your pest control right away. Clean up all evidence of pests but also eliminate the problem. Potential buyers will pick up on this and it’s a costly and stressful fix that they don’t want to take on with a new house. 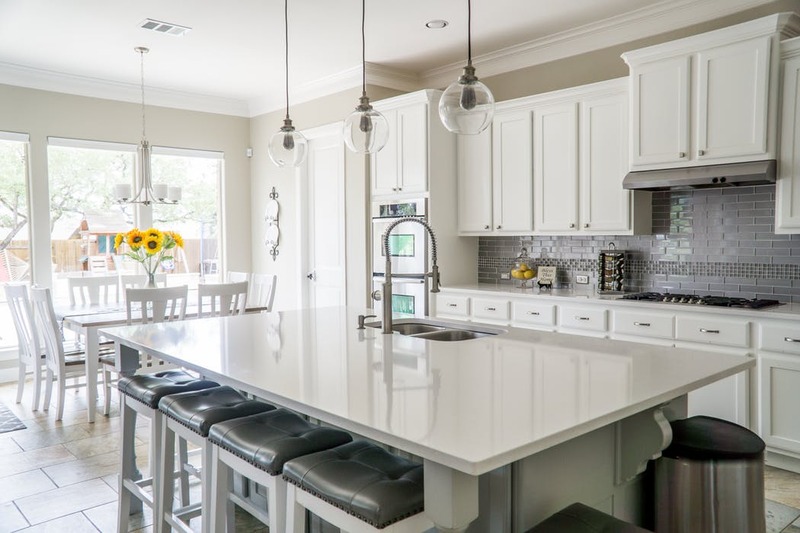 Keep your kitchen sparkling and tidy for a much better impression of your home on potential buyers.